The findings reinforce the need for Colorado’s juridications to adopt standardized, streamlined solar permitting practices. The Colorado Fair Permit Act (HB 11-1199) has passed out of the House on a 64-1 vote and now moves on to the Senate. Stay tuned! 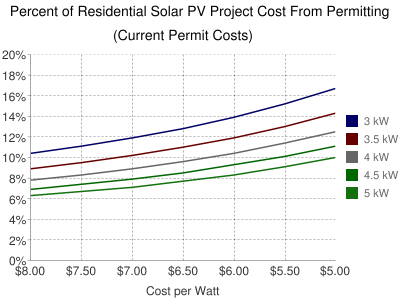 Solar permitting remains a looming cost barrier to distributed solar, so it’s great to see that Vote Solar’s Project:Permit is gaining traction. Update 6/7/12: Colorado’s Fair Permit Act was signed into law in June, 2011, requiring permit fees to be based on the actual cost to issue the permit and not to exceed $500 for a residential solar project or $1,000 for a commercial one.